Next Article We remember Dickens and the Titanic. So why have we forgotten Henry Bell? 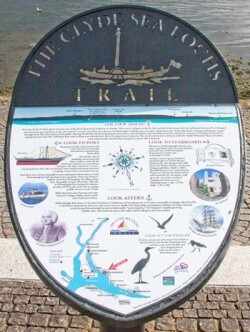 The panel replaces an earlier version which was one of ten put in place to encourage motorists to explore ‘The Clyde Sea Lochs Trail’, a scenic coastal route from Dumbarton via Cardoss, Helensburgh, Rhu, Garelochhead and the Rosneath Peninsula to Arrochar. Before asking 'Mr Bell' to perform the unveiling, John Urquhart, the chairman of the area’s new local tourism destination organisation, Love Loch Lomond, thanked Argyll and Bute Council for supporting the upgrade project. He explained that the old panels had accompanying print material and over the next period, if funding could be found, it was the intention to reinstate all the panels and redevelop the concept with the addition of modern mobile app technology, thereby helping to bring more visitors and economic benefit to the Clyde Sealochs area. After the unveiling, 'Mr Bell' reminded everyone that in 1804 he had been Helensburgh’s first provost and said how pleased he was to return to the town after 200 years. He also complimented the organisers in producing such a handsome illustration of the Comet and promised to return in another hundred years to celebrate the vessel’s tercentenary. Design work for the panel was carried out by Rhu’s Alan Pyke, who has given design support to a number of local initiatives over the years. His illustration of the Comet also featured on the souvenir items produced by Helensburgh Heritage Trust for the Comet Bicentenary.